Former Blink-182 drummer Travis Barker is back in the studio less than two months after being involved in a harrowing plane accident. 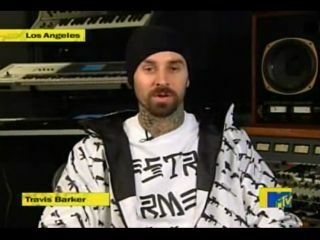 Barker appeared via satellite from his studio in Los Angeles yesterday (16 November) for MTV's Total Finale Live. "Thanks for all the support," the drummer said. "I feel better every day." The appearance was Barker's first on-camera interview since a private plane skidded off a South Carolina runway in September, killing four and leaving him and bandmate DJ AM severely burned. Barker said he hopes to make music with AM again soon. "It was like riding a bike," the drummer said of his first time back behind his drumkit. "It was really exciting to know I still have my chops. It still felt good. I still can make it around the kit. Everything felt right, so I'm thankful to be able to play." Barker's former Blink-182 bandmate and current +44 member Mark Hoppus said he expects the drummer to full recover and return to music full-time soon. "He can't not drum, you know? The man was born to sit behind a drumkit and do his thing," Hoppus said. "The doctors are saying that his body is really healing in a positive way." As for the future, Hoppus added: "No matter what I work on, Travis will be part of, for sure."